Oct 31th 2014 – YEAH BABY!!! All Time High Closes! I feel a little like the sports writer that has run out of superlatives for the superstar on the field. The superstar being the Dot2Dot trading system. I am totally gobsmacked…practically speechless at the advance today. I have a picture on the facebook page with my big smiling face minutes after the announcement of the doubling of investments from the Japanese government into Japanese and international stocks last night. Literally Hundreds of Billions of dollars will be dumped into the stock market in the US in the coming months. Basically, Santa came early!! I remember being somewhat afraid of stepping back into the lion’s den at the bottom of this move in the Indexes, little did I know that I was about to experience the best collective set of trades I have had in quite some time. Not to say it can’t be repeated, because it will be, but the rapid nature of this particular advance only comes around once every couple of years. Just extraordinary. I can tell you, it is just so exciting knowing that I am really making a difference in people’s lives. Sure, it’s a great feeling to see my own account shoot for the moon, but it’s actually a better feeling, a stronger emotion knowing that I am making a difference and collectively earning hundreds of thousands if not millions of dollars for other people this month. So thank you for the faith, I am truly honoured to have people that believe in possibility along the ride with me. The U.S. dollar climbed against the currencies of major trading partners, including the Japanese yen, while dollar-denominated commodities including gold and oil dropped sharply after the Bank of Japan increased its yearly target for monetary expansion to 80 trillion yen, or $724 billion, from as much as 70 trillion yen. The move comes in the same week the Federal Reserve said it would end six years of U.S. bond purchases. The Dow Jones Industrial Average rose 200 points to an intraday record of 17,395.54, and ended up 1.1 percent for the session, and 1.9 percent for the month. After coming within 2 points of its intraday record set Sept. 19, the S&P 500 added 1.2 percent to finish at a record close, with energy leading gains and utilities the sole decliner among its 10 major sectors. Trading at a multi-year high, the Nasdaq rose 1.4 percent. The CBOE Volatility Index, one measure of investor uncertainty, dropped 2.7 percent to 14.12. On the New York Mercantile Exchange, gold futures for December delivery dropped $27, or 2.4 percent, to $1,172.70 an ounce. Crude-oil futures for December fell 90 cents, or 1.1 percent, to $80.22. The yield on the 10-year U.S. Treasury note used to figure mortgage rates and other consumer loans rose 2 basis points to 2.3347 percent. Equities offered muted reaction to Friday data that had U.S. consumer spending unexpectedly falling in September, a gauge of manufacturing activity in the Chicago region hitting 66.2 in October, better than the estimated 60.0, and U.S. consumer sentiment rising to 86.9 in October versus an expected 86.4. 30th Oct 2014 – WAIT…WHAT…Up Again…REALLY?! “I was not expecting that”….the kind of words immortalised by Simon Cowell after an unknown contestant on X Factor comes on and knocks it out of the park! This market just doesn’t want to top out. It wants to keep marching. As they say, ‘the trend is your friend’ and it continues to be up, but surely it is time the party wound down? Everything in my “thinking” was telling me that after yesterday’s pause we were going to start to see some sizeable selling today. Therefore, I was as surprised as the dog in the picture! Helping fuel the rally today was one of the DOW heavyweights…It seems that we are all spending more money on our Visa’s as their earnings caused the DOW Jones to rally ahead of the other major indexes. VISA, a gigantic financial power house, closed up and incredible +10%. Also, later in the day, the GDP report coming in at 3.5% caused the market to rally even higher. We are closing in on all-time high’s again, and who in their right mind would have thought that possible a week ago? For those that are still in this incredible trade with me, congratulations, I am genuinely delighted to make a difference. However, for those that missed it, don’t worry, we will catch a few of these every year, this is not a one off and will be repeated. For now, stay the course, follow the system and YOU WILL WIN! U.S. stocks jumped on Thursday, with Visa helping lift the Dow industrials into the green for October, after data showed the U.S. economy grew more than expected last quarter. After a 249-point jump, the Dow Jones Industrial Average was lately up 186.49 points, or 1.1 percent, at 17,160.80, with Visa pacing gains that included 21 of 30 components. The card-payment processor reported a better-than-expected adjusted quarterly profit while projecting mobile payments would increase business. The S&P 500 rose 7.44 points, or 0.4 percent, to 1,989.74, with utilities and health care pacing sector gains that extended to all but the energy and technology sectors of of its 10 major industry groups. The Nasdaq rose 2.72 points to 4,552.94. The Commerce Department said gross domestic product grew at a 3.5 percent annual rate in the third quarter, bolstered by a smaller trade deficit and a rise in defense spending. Another report had the number of Americans filing for jobless benefits rising last week, but the four-week average fell, illustrating ongoing improvement in the labor market. Who wants to play a game with me? What a terrific weekend! We always have such a great time when we run our courses. It is absolutely reliable that we will have a room filled with fantastic people who are eager to learn about how to have certainty when they trade. Certainly one of the highlights of the weekend for us was our trading game – what a blast! It was so great to see how everyone got it, the simplicity of it all. We are looking forward to meeting a whole new group of people tomorrow night in Vancouver at Anyone Can Retire in 10 Years. For now…to all of our Power Up attendees – YOU are an AWESOME trader!!! Oct 24th 2014 – My Tail is Wagging!! My tail is wagging as my portfolio is up an additional +40% in just over a week!!!! I am getting positively giddy as the market continues to climb and surge off the recent lows. I know at some point someone is going to stop the music, but while the band is playing I’m going to continue to dance my jig. One of the questions I get asked is why I don’t have profit targets. There is a simple answer and a systematic answer to that question. The simple answer: Because you must ride out big winners till the horse is exhausted. The systematic answer: As a trading systems designer, I found upon testing that it was less profitable to limit your gains. It is very important to limit your losses, but foolish to limit your gains. Like all traders, I obsess with trying to pick tops and bottoms, I’m very good a grabbing the bottom, but tops are a little trickier and require a small retracement to profit take…therefore, until I am able to nail them both I will continue with my obsession! U.S. stocks climbed on Friday, with Wall Street derailing a four-week slide with its best week this year, as quarterly results from companies including Microsoft and Procter & Gamble inspired investor enthusiasm. The declining price of crude has nearly half of U.S. gas stations selling gas for less than $3.00 a gallon, with the national average at $3.07 a gallon, the lowest since January of 2011, according to AAA. Microsoft rose after the software titan posted better-than-expected quarterly revenue; Procter & Gamble climbed after the household products maker reported quarterly results and said it would split its Duracell battery business into a separate company; and, Amazon.com dropped after the online retailer offered a weak sales outlook for the holiday quarter and third-quarter results came in below estimates. A report from the Commerce Department on Friday had new-home sales rising 0.2 percent to a six-year high in September, while the pace of August sales was revised sharply lower. After an early dip of 28 points, the Dow Jones Industrial Average jumped as much as 132 points, and ended about 0.8 percent higher, with Procter & Gamble leading blue-chip gains. The S&P 500 added 0.7 percent, with health care pacing gains and energy falling hardest among its 10 major sectors. The Nasdaq rose 0.8 percent. The Russell 2000 Index of smaller-cap companies wavered as market participants debated the impact of the anticipated end of the Federal Reserve’s bond purchases, also known as quantitative easing. Advancers outran decliners by a 3-to-2 ratio on the New York Stock Exchange, where 464 million shares traded as of 3:40 p.m. Eastern. Composite volume cleared 2.4 billion. Analysts downplayed concern about the Ebola, with a doctor who worked with Ebola patients in West Africa in an isolation unit in New York City after testing positive for the virus, making him the fourth person to be diagnosed with Ebola in the United States and the first in the nation’s biggest city. Another great day to be long the market, although it did wobble at 3pm to close off the highs on rumours of another Ebola outbreak, this time in New York. However, it is still not time to profit take despite the massive gains of the last 5 days. As the quote says, when you get it right, you need to go for the jugular, it takes courage to be a pig. As despite ‘let your winners run and cut you losses short’ being a well-known and accepted recipe for success to all market participants. It remains emotionally difficult to do. That being said, as a system trader with high probability of success on my side, there is no thinking to do, you can and will experience all the emotions, but you must just follow the system that has been designed to win every year. U.S. stocks surged on Thursday, lifting the Dow industrials back into positive terrain for the year, as heavy-equipment maker Caterpillar boosted its profit outlook and an unexpected increase in euro-zone manufacturing eased worries about the global economy. But equities pared gains in late trading as New York City’s Bellevue Hospital said it was testing a doctor who recently returned from West Africa for Ebola after he exhibited some symptoms consistent with the virus. He was the latest of many patients to have been tested for Ebola-like symptoms in the city in recent weeks; all of the prior tests were negative. Investors fled perceived safe-havens including U.S. Treasury notes and gold, buying assets viewed as riskier as corporate earnings and projections for the future, especially from multinationals, eased worries about the global economy. Caterpillar rallied after reporting a quarterly profit that soared past estimates; 3M jumped after the diversified manufacturer posted higher quarterly profit, and General Motors also tallied a better-than-expected profit in the third quarter. Thursday’s economic reports had the four-week average of Americans filing for jobless benefits dropping to a 14-year low. The Conference Board’s index of leading indicators for September increased 0.8 percent. Surveys had euro-area businesses performing far better than expected in October, along with a slight expansion in China’s manufacturing sector. The breaking news of an attack on the Canadian Parliament in Ottawa, with the subsequent death of a soldier, certainly spooked the market today. With this awful news it seems perhaps less important to talk about the stock market today. My thoughts go out to the friends and family who are affected by this terrible tragedy. U.S. stocks turned lower on Wednesday, following the S&P 500’s biggest jump in a year, as investors considered the fatal shooting of a soldier in Ottawa, reports of gunfire in the halls of Canada’s Parliament and oil falling to a more-than two-year low. A military guard died after getting shot at the National War Memorial in Ottawa, with multiple rounds then reportedly fired at the adjacent Parliament building. The gunfire followed increased worry about terrorist attacks in Canada, where a radical jihadist ran over two soldiers in a suburb of Montreal on Monday, killing one. Equities began to ease gains as the price of oil turned lower after data had U.S. inventories rising more than expected. U.S. consumer prices climbed marginally last month as energy prices declined, illustrating tame inflation that should allow the Federal Reserve to keep interest rates low for a time. The Labor Department’s Consumer Price Index edged up 0.1 percent in September after falling 0.2 percent the prior month. Oct 21st 2014 – Biggest Gains of the YEAR! 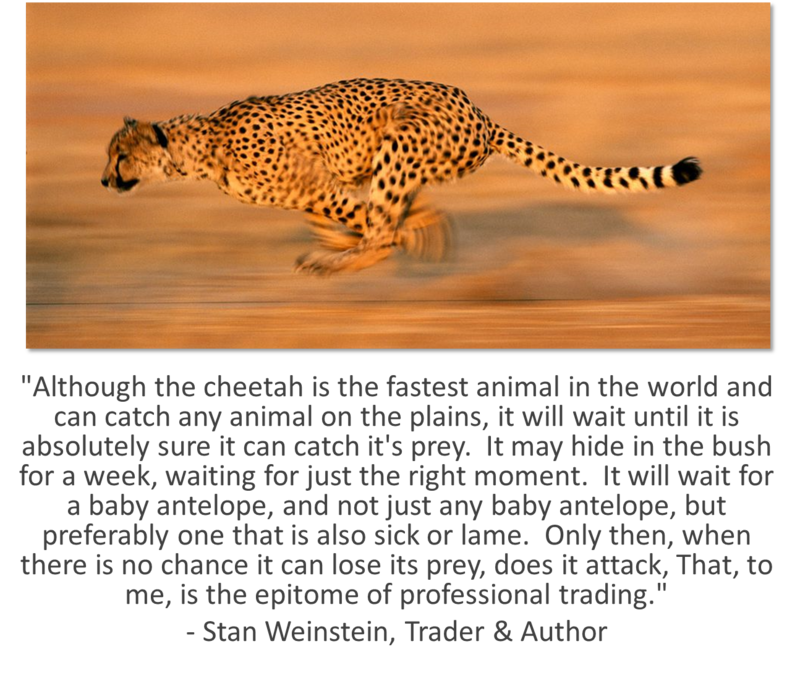 Just like the Cheetah, it pays to wait for the right opportunity to strike when the market is sick and lame. My account is up close to 30% since Thursday, an incredible performance in such a short space of time. I will of course continue to be humble and grateful for whatever the market gives me. But it is very empowering seeing the system you have worked so hard on and for so long return in such an extraordinary fashion by design. To be able to take advantage of these bottom grabs again and again is just so exciting and quite frankly effortless for my system. All this on top of the fact that I exited long before the market dropped 10% recently, keeping my powder dry for this latest smash and grab. It seems to me that the market will be driving back towards 1970, possibly beyond in the next few trading days. I can be wrong, but that is my short term expectation. However, given the last 3 days of wonderful gains, I expect tomorrow will be sideways if not down a little. But as much as it is tempting to profit take, the system is there to be followed…Don’t Think! Don’t Think! Don’t Think! U.S. stocks surged on Tuesday, with the S&P 500 and the Nasdaq Composite extending gains into a fourth day, as investors embraced earnings from corporations including Apple, Texas Instruments and United Technologies. Verizon Communications gained after the wireless carrier tallied revenue above estimates; Coca-Cola and Chipotle Mexican Grill were active to the downside, as the beverage maker and Dow member cited currency headwinds in cutting its growth outlook, and the burrito chain signaled increased growth in quarterly sales would not continue forever. Benchmark indexes held and then added gains after a report had sales of U.S. existing homes in September increasing to a one-year high. The Dow Jones Industrial Average jumped 215 points, or 1.3 percent, to 16,615.00. Pulling above its 200-day moving average of 1,906.89, the S&P 500 advanced 37.27 points, or 2 percent, to 1,941.27, with energy the best performing of its 10 main industry groups. The Nasdaq jumped 103.40 points, or 2.4 percent, to 4,419.48. Developments from overseas had Reuters reporting the European Central Bank is looking to purchase corporate bonds on the secondary markets. And, Data on Tuesday showed China’s gross domestic product grew 7.3 percent year-on-year in the July-September period, the slowest pace in nearly six years. Still, the figure was above forecasts for a 7.2 percent rise. Other Chinese data showed September industrial output increasing 8 percent year-on-year, beating estimates, but retail sales and fixed-asset investment both missed expectations. Got to feel for Mr. Buffet this morning, just as he was sitting down to his cornflakes he finds out he is down $1 billion dollars! His massive stake in IBM took a major haircut after earnings were released, but I am sure he is not panicking, just maybe having a liquid lunch! Another strong move up as we now wait on results from the tech giant Apple, should the earnings be as positive as expected we may see another move higher tomorrow. It certainly looks like we have indeed put in a bottom at 1820, but just where the next top is now that we are back above 1900 on the S&P is difficult to say. Europe should re-bound tomorrow after taking quite the hit today, they will no doubt follow the lead from the US markets today, which I suspect will help the North American markets tomorrow. Let the trend continue as fear of missing the rally takes the place of fear of losses. U.S. stocks climbed on Monday, with the S&P 500 marking its longest winning run in a month, as expectations for Apple’s quarterly results outdid disappointment that came with a reduced outlook from International Business Machines. In addition to Apple’s results, economic data on China’s GDP after Monday’s close could impact trade on Tuesday. IBM shares slid 7.4 percent after the technology giant and Dow component posted third-quarter earnings short of estimates. Apple gained 1.9 percent ahead of reporting results after the close. Of 87 companies in the S&P 500 that have reported third-quarter results, 63.2 percent have beaten earnings expectations, 10.3 percent have reported in-line earnings and 26.4 percent have missed, according to Thomson Reuters. As the great William Shakespeare wrote in his masterpiece Henry V: “Once more unto the breach, dear friends”. That’s what it felt yesterday as my system gave me buy signals across the board. Sometimes trading feels like a war, but ultimately that is not how it should be. Price is the only thing that matters, and we must find a way to flow with price, isn’t that what nature tries to teach us, just as in the ancient Taoism theory, flow with the energy. So it was highly probable (but never absolute) that we were going to have a relief rally today, but it still takes faith and belief to step into the breach. U.S. stocks rallied on Friday, softening weekly losses, as investors bet on further stimulus from central banks and corporations including General Electric and Morgan Stanley reported profits that topped expectations. Morgan Stanley gained after the investment bank tallied third-quarter earnings that beat estimates. General Electric climbed after its quarterly profit exceeded expectations. The Commerce Department on Friday reported new-home construction climbed 6.3 percent in August, signaling improvement in the U.S. residential real-estate market. The preliminary read for consumer sentiment in October came in at 86.4 versus a 84.0 estimate. In prepared remarks delivered Friday, Fed Chair Janet Yellen voiced concern about income inequality in the United States, saying by some accounts, it is near its highest level in the past 100 years. On Thursday, St. Louis Federal Reserve Bank President James Bullard said the central bank should think about postponing the end of its bond purchases. Posting its longest weekly loss streak since August 2011, the S&P 500 added 1.3 percent. The Nasdaq climbed 1 percent, down 0.4 percent from last Friday’s close. The Russell 2000 edged lower, but scored its first weekly gain in seven. The 25 percent decline in crude over the last four to five months has translated into a 15 percent drop in prices at the gas pump, which theoretically could drop another 10 percent as we play catch up. I really liked that movie, “After Earth”. The quote above sums up how I am thinking having just re-entered the market. Having sat out in cash as the market corrected about 10% across all the indexes, I admit some trepidation (I would not be human if I didn’t) having been filled on a few orders today. But as the quote says, fear is a choice and I choose to trust my system…fear be damned! Historically at least, after so much selling we are due a decent relief rally. The S&P 500 put in a double bottom shortly before the market open in the futures before rebounding right off the mark to close marginally higher. It was an impressive feat similar to the massive comeback yesterday. Therefore technically, I have not changed my opinion that this is at least a short term bottom here and we will be back above 1900 by early next week. It is only a matter of time before greed takes the place of fear. U.S. stocks ended little changed on Thursday, with the Dow industrials recouping much of a 206-point deficit, as investors balanced worries about global growth against mostly better-than-expected U.S. earnings and economic reports. For every share falling more than two gained on the New York Stock Exchange, where nearly 1.1 billion shares traded. Composite volume cleared 5 billion. Apple fell after the supplier of consumer technology showed off its latest iPads and said it would launch a wireless payment system on Monday. Upbeat data on the U.S. labor market did little to nothing to curb selling in the early going, with the same true of earnings from companies including Netflix and Goldman Sachs Group. The government said its count of Americans filing claims for jobless benefits dropped to a 14-year low last week, falling by 23,000 to 264,000, its lowest since 2000. Separately, U.S. industrial production rose 1.0 percent in September, versus expectations of 0.4 percent. Less positive was a u-turn in confidence among home builders in October, falling sharply after rising to a nine-year high the prior month. Stocks recovered much of their drop after St. Louis Federal Reserve Bank President James Bullard told Bloomberg News that the Federal Reserve should consider postponing the end of its bond purchase program to stop the drop in inflation expectations.